Solicitations for guest posts, product endorcements, partnerships, etc are ignored. This isn't the blog you're looking for. I’m very delighted with how Alexis’ baby book turned out. The additional two and a half years of camera experience made an incrible difference, and the concept was easier to execute this time. Like last time we decided to go with a 24 page book and 12 images, one for each month. Rather than spell her age in the baby blocks, which proved challenging, I wrote her age on the blank left page. Solid color onesies are the way to go if you’re going to shoot against a white background. I was worried about colored onesies clashing against the blocks, but the white onesies fadded into the background a bit too much. I liked doing a different colored onesie much better. A tan colored bear would have probably been better too. The bear is easier than the blocks, but that doesn’t mean it’ll be easy. I’m sure any style of photos gets difficult beyond a certain age. I figured going into this project that I’d be able to at least get cute photos of Alexis interacting with her bear even if she wasn’t doing quite what I was hoping for. 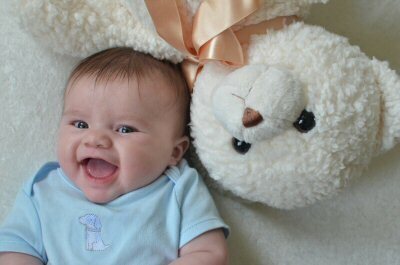 It turns out if your under one knocking the bear off set is hilarious, especially right after mommy just put it back. Now all that’s left to do is wait for a coupon from MyPublisher. I have no idea what we’ll do if we decide to have a third child. I feel compelled to keep changing it up. It was bound to happen eventually. I’ve been picking up my camera so often that I felt my interest began to wane a little. I was beginning to feel like I was taking the same photos over, and over, and over again. I love the photo journalistic style, but after awhile of filming the same sets of subjects, in the same settings, it starts to feel very repetitive. I needed a new challenge. Alexis in the spotlight, only this time achieved with an open window and not a desk lamp. As luck would have it, I’m also shy of formal photos of Alexis. Turns out when you no longer have the two to one parent photographer to child subject ratio, the two man strategy of baby photography doesn’t work so well. It’s much easier to take photos of Alexis doing normal baby things (crawling, playing, cruising) than to worry about any kind of posing. I ended up using nap time to gather backdrops & props. I like to set Alexis down on the crib mattress instead of the rug directly, as the mattress helps keep the backdrop smoother than the rug does. There is a potential rolling hazard, so I mostly like to keep Alexis in a sitting position for formal photos. If she drops to her belly, I drop the camera. Once on my foot. Apparently that’s hilarious if you haven’t reached your first birthday yet. The trade-off in pursuing formal photos is there’s less time for the photo journalistic slice of life photos I tend to take. That’s less photos to choose from for her baby book, and milestone posts. I think I am okay with that as long as ‘less’ doesn’t translate to ‘none’, and I capture the emerging skills like crawling and walking. I know I’m very happy with the above photo. Disclosure: This blog post contains Amazon affiliate links. I may earn a small commission with each affiliate link click. For more details please see my full disclosure about blog profit. This has been one of my most ambitious photography projects, and also one of the hardest secrets to keep. Now that each of the grandparents have received their baby book Christmas gift, I wanted to share this project with you! For Nicole’s baby book we purchased a 24 page photo book, using 12 whole page images. I had been reading a fair number of ‘mommy blogs’ when I was pregnant with Nicole, and wanted to do an age progression baby book. I thought I’d be different and use baby blocks instead of the typical tummy stickers. I couldn’t believe I hadn’t seen anyone else use baby blocks before. It seemed like such an obvious idea. Turns out there’s a reason the stickers are so popular. The first couple of months with the blocks were easy, but once she realized she could reach those blocks, everything got a whole lot harder. My intention was for each month to represent a different milestone: smiling, sitting, clapping, first tooth, etc. I also had this grand vision of the baby blocks neatly aligned, a big smile on Nicole’s face as she looked straight into the camera. Ahh Naive Sarah, so Naive. While cute in concept, the milestone idea was the most difficult aspect to execute. I gave up at seven months. I was having too hard coming up with milestone ideas, and an even harder time convincing Nicki to show off the desired milestones. 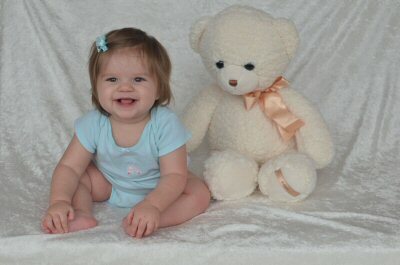 Instead I repeating some poses (on her back for 2 & 8 month photos, on her tummy for 3 & 9). It worked out for the better. I think the repeated posses really emphasized how much she had changed. I only wish I had given up on the milestone idea sooner. 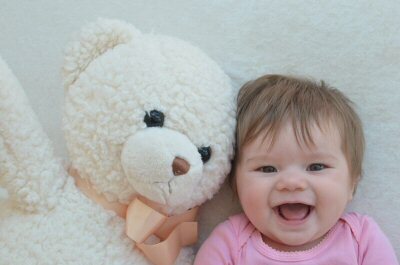 Her five month milestone is holding a block, but in reality she was able to hold much sooner, and the 5 month photo feels so different because of it. Variety is key. Once I’d given up on the milestone idea, I started doing multiple different posses each month: sitting, lying down, to the left of the blocks, right, etc. This gave me more flexibility, so if the only good 9 month photo was of her lying down, I could use her 8 month sitting photo and not have the same pose back to back. Consistency is hard (and it’s noticeable when things aren’t consistent.) I accidentally used a different lens on month 6, and with the difficult winter lighting the photo looks different from the rest. Even with the same lens and same camera body, the camera settings will need to change. As Nicki grews and became more mobile, the depth of field necessary to keep her in focus as well as the shutter speed needed to freeze the motion changed. Add the changing lighting conditions and it’s easy for photos to start having minor differences in the amount of shadow, brightness, etc. Next time I plan to print out the previous month’s photos so I can immediately compare them with the current set. I hope that makes it easier to achieve a consistent look. Photo editing can save your sanity. A number of the above photos were off center, or had the backdrop edge in the photo. Hey, it’s HARD to get everything lined up perfectly with a squirmy child! 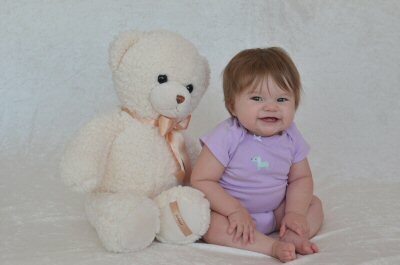 For the 10 month old photo she’s staring right at the camera and smiling. It was the only one where she was in focus, smiling at the camera. The problem? Almost half that background wasn’t a backdrop at all. I ended up shooting at a slightly different angle than anticipated and the backdrop wasn’t wide enough. Indeed the raw photo contains the door and some of the hall way. Since retaking the photo isn’t always a practical idea (go ahead, try and ask a ten month old to pose the same way again), it’s worth spending a little time learning how to clone the background and fix those minor issues. 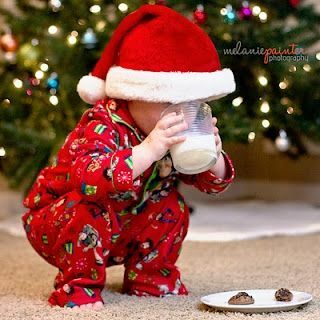 I’ve loved the idea of a milk and cookies in front of the Christmas tree photo ever since coming across this photo. I think these were some of Nicki’s favorite photos too, for obvious reasons. I’ve been trying to do more of these kinds of photos, technically formal in the sense that I planned the photo right down to the Christmas PJs and pig tails, but the could have been spontaneous. So far my strategy is to set the scene, typically during nap time, and let her do her own thing. We have never given her sugar cookies before. Outside her birthday party and cake smash, we have never given her frosting. Me thinks someone has had frosted sugar cookies at day care because she knew just what to do with those cookies! Frosting first! And, oh boy, did she attack the frosting. It went everywhere! You can’t really see it in the small photo above, but she actually has green frosting over her left eye brow. I can’t get over how big she’s getting. It seems like just last weekend she was my bitty baby, and now she’s a little girl. It all goes by way to fast. PJs – Target pre black friday sale ($10). Take 2, two weeks later (12/22) with the presents and stockings. Mommy does better with practice, and Nicki doesn’t mind obliging mommy. Add another $3 for more cookies, but totally worth it. Forgive me, I’ve had a bit of an adrenaline crash after moving, defending and starting a new job. My intention was to be completely unpacked before starting work on Monday (ha! We’re still no where near unpacked), and finished my final version of my thesis (also didn’t happen, but I’m still waiting on feedback from one member). I think I managed one box since Monday. These were taken at the beginning of October, before our house and apartment both started resembling something out of hoarders. We purchased the shoes thinking they would double as holiday shoes. The photos here are out of order, the last one was actually taken first. Nicki was having a hard time walking in the shoes on the backdrop, so we nixed them. Normally Nicki loves her dress-up for a photo time. The skirt and pearls she couldn’t get enough of! This time she wasn’t as into it. I think it was the tulle skirt she didn’t like. In the past she’s loved the skirts that were soft and flowy. The tulle doesn’t move the same way; it’s scratchy. We had a fairly good idea that she’d like the fan (super girl needs a breeze in the hair and the cape!) and we got quite a few smiles with it. Once the novelty of the fan wore off, we were done with picture time. There weren’t as many cute photos this time around. I am tempted to get another super girl custom, one without a tulle skirt, in an after Halloween sale and take a few more photos. I can be forgiven for doing ‘Halloween’ photos in November, given everything that’s going on, right? Of course, with the holiday’s coming up, I’m sure there will be no shortage of photo opportunities! Total Cost: $40.25, but we can reuse the outfit for pretend play and the shoes are pretty basic and can do with just about anything. A while ago I went looking for baby photography ideas back in may, and stumbled upon this gorgeous photo of a baby and pearls. (I actually found both photo inspirations on the same webpage, but wanted to link to the actual photographers.) I adore the color pallet, and that the baby is interacting with the pearls rather than just wearing them. I’m not normally into ‘girly’ photos, but I started to imagine Nicki with pearls. I was inspired. I set off to Micheal’s to get some pearls that weekend. I decided to strand the pearls myself so I could have control over the length, size & color of the necklaces. To be extra safe I used fireline, and each necklace is double stranded. This was definitely one photo where I wanted to have my safety spotter! Next I was on the hunt for a cute diaper cover. That’s where the idea stalled. Remember the diaper cover I used for Nicki’s Smash cake? I had originally intended to use it for this photo, but the coral color was a bit too bright. I was out shopping for fall clothes this week and saw a delicate pretty lace skirt, which I knew would go great with the pearls. For a backdrop I used a teal (official color description is “peacock”) bed sheets to help the pearls pop against the background. How gorgeous are those eyes?! I know I’m biased, but she is such a beautiful little girl. I am amused that Nicki wasn’t really that into playing with her beads. She loved them, was smiling, clapping and “dancing” while wearing them, but she didn’t put them in her mouth and investigate them. That’s not what I would have predicted! These ended up nothing like my inspiration source, but very true to Nicki, and I love them. My little girly-girl loved her pearls. Fire Wire String (Micheal’s) – $8? Warning, look away if you have a soft spot for pastries. Normally I like to have at least two or three “sessions” for each “shoot”. (Typically I break the sessions out over different days/weeks to deal with baby sized patience levels. Hers and mine.) It can take me that long to get the photo I want. While I’m sure Nicki would love to destroy multiple smash cakes, there’s a limit to how much sugar I am willing to let her ingest. I am only allowing myself one session for this. I didn’t want to risk my white satin backdrop, as I still need it to complete her baby book, so my first stop was to the craft store to get a background fabric. I know, I know – “real” backdrops are not draped fabrics, but I some fabrics work well enough for a tiny fraction of the cost. I took the diaper cover I was planning on using to the store to pick out a fabric that would go with it that would also be somewhat resilient to having cake smeared all over it. I ended up with a dark brown pleather for $10.78 that I’m planning on reusing. I knew I was going to use my 35mm prime lens (the 50mm crop would be too tight, and the only other option would have been my kit lens). But what settings should I use? I tend to err on too wide an aperture, and too slow a shutter speed, due to poor lighting in my house. In order to get these settings correct from the start I started playing around. I took a few photos during bath time this past week and learned I needed a shutter speed of 1/320 of a second to freeze a splash. (I normally try to get away with 1/125.) I also tested the shooting space with a few props and learned I needed a f-stop of about f/2.8 to make sure she’d be completely in focus. This left me needing an ISO of at least 400, and I still had a slight under exposure according to my camera’s metering light. The test image, however, looked completely washed out in the “correct” exposure, so I figured I’d go with the under exposure. My guess is the metering light was tricked by the dark background into thinking the image was too dark overall. At first she just picked off the sprinkles and poked the frosting. Too cute. I think I like this! Nicki realized she could rake her hand across the cake and destroy it that way. Grand fun. It ended up being more cake destruction than cake eating. I’ve seem much messier faces after spaghetti! But she had a ball with it, and that’s the important thing! At one point I decided to step down my shutter speed to 1/250 seconds. Just one step to try and let in a little more light. Big mistake. She started waving with her hand covered in frosted cake goo and it went everywhere. Of course 1/250 was just slightly too slow and I have motion blur. Live and learn, live and learn. Total Cost – $43.16 before tax. I thought I’d start keeping track of how much these little photography projects (and projects in general) cost. I am a numbers person, after all. I keep assuming the reason I’m taking more photos these days is because I’m forcing myself to pick up the camera more often. As I think about it, though, there are more opportunities to pick up the camera: crawling, walking, even just playing with toys. She’s doing more so there’s more memories to capture and save for posterity. This weekend I was looking for something different to capture on digital film. I poked around on the internet, but was coming up empty for ideas until I stumbled upon a photo of a sweet baby boy looking out the window. 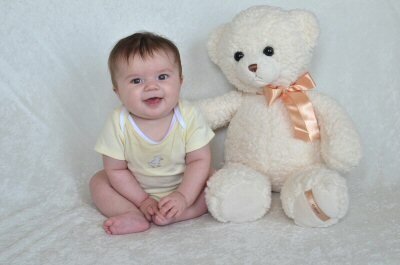 The boy sat on the floor, his back to the camera, flanked by a stuffed animals. (ETA: I finally found the photo that served as my inspiration!) It was such a sweet photo. I thought of our living room window and how I had used it for my DIY maternity photos almost a year ago to the day. As luck would have it, there was a cloudy drizzle early this morning, is unusual for this time of year, giving the curtains a soft glow. I couldn’t resist. Whenever I look at this photo I instantly image a few decades into the future, but also think back to a year ago when I stood in the same spot. My heart, it melts. I shouldn’t lament the end of of posed baby photos. It’s true, I can’t pose her anymore. She’s going to do her own thing. Sometimes that will work for the photo I have in mind, sometimes it won’t. Nicki didn’t want to just sit still in front of the window, peacefully amoungst the stuffed animals like the boy I saw in the photograph. She wanted to play. Even her favorite a stuffed animal sitting by her side would not distract her from grabbing the curtain and twirling it around herself. The best photos aren’t forced, anyway. Last Friday I decided to take more photos of Nicole with my old camera. I liked the last set, but silly me put her in a white onesie that was a bit too much against the white backdrop. It also generally takes a couple iterations before I get the “perfect” shot, so I always like to re-try photos. You never know when a great photo will turn into an perfect one! 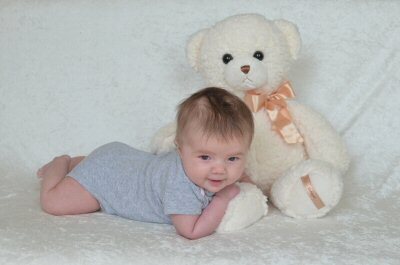 The last good posed photo I will ever take, until she’s old enough to pose on request. And, ironically, the purple also looks a little washed out against the white background. Nicki was acting hungry so after a few quick photos we took a break for an early lunch. 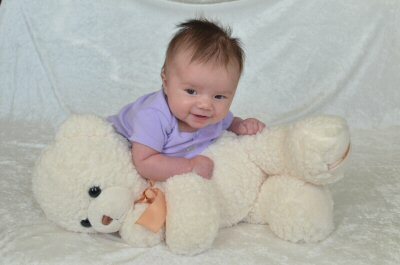 When I put her back down on the backdrop again and she popped right up onto all fours and crawled off! I put her back down, but she would not stay put. She wanted to sit and play with the camera, not lay down. So I gave up, followed her lead, and took some photos of her sitting with my camera. After waiting so long for her to finally crawl, I was lamenting the days when she’d stay put! The other day I decided to try for another profile like I had been meaning to do for a couple weeks. I had accomplished this shot by draping a black bed sheet over the back railing of her crib (a super cheap backdrop, especially if you already have one!) setting her down on one side, and opening the window on the opposite side to get the light streaming on her face. Domingo then holds a stuffed animal to get her attention so she’ll look in the direction of the light. We tried the same set up again, and just as with the camera photo she was off! It didn’t matter that Domingo was standing by the window, and there was no way she could reach him. She wanted to get as close to that stuffed animal as possible, and that meant pulling herself up at the edge of the crib! No sitting still for this little one. 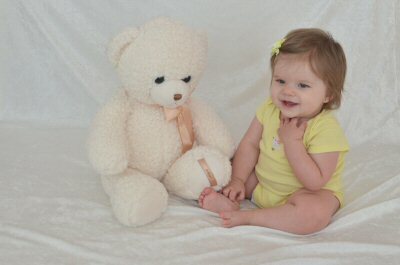 The only success we had was to finally give her the stuffed animal and let her hold it, but it was still an incredibly short photo session. Clearly holding her toy. I’m going to try again later. Maybe I can find a different toy that I can more easily crop out. Time to adapt my strategy. Thinking back, the Easter photos worked so well because she was exploring her new toy, the easter basket. She also enjoyed pushing the button on the camera and watching the LCD screen change (which, incidentally, is what made it look like she was taking a photo.) She needs something to keep her occupied if I’m going to get her to stay put. I foresee many more interactable props in our future. At Nicki’s last dr’s appointment her pediatrician commented that Nicki must “liked the orange vegetables”. Domingo thought that meant she was still wearing some of breakfast. (Confession Time: It wouldn’t have been the first time we had purees up the nose.) It wasn’t until I was taking photos of Nicki a few days later that I realized what the doctor was saying: Nicki is turning orange! The recommendation when starting solid food is typically to stick with the orange veggies first, since they tend to be the most universally liked. The green veggies come next, followed by fruits, meats & yogurts. Gerber’s state 2 veggie options are: Carrots, Sweet Potatoes, Squash, Sweet Potatoes and Corn, Mixed Vegetable, Garden Vegetables, Green beans, and Peas. Mixed Vegetable? First ingredient is carrots. Garden Vegetables Mix? Second ingredient is carrots (and the third and final ingredient, Spinach, has beta carotene as well). That only leaves 2 non-orange options out of 9. Thinking about a meat puree? Unless it’s chicken apple, the first ingredient besides water is either sweet potatoes or… wait for it… carrots! There’s even beta carotene in breastmilk! In other words, unless your child only eats fruits (and yogurt), there’s a good chance baby is getting a fair amount of beta carotene. Nicki gets one vegetable, one fruit, one yogurt and rice cereal daily. We mix up the vegetables so she gets a pretty even mix. The orange veggies have lots of good nutrients necessary for her health, including beta-carotene, so I don’t really want to skimp on them in favor of more peas and green beans. Changing her diet for cosmetic reasons is beyond silly. The amount of beta carotene in her diet will decrease when she gets table food, but she’s not quite ready yet (my guess is next month) so we’re going to have to live with the orange hue a little while longer. It’s not really noticeable. That is, until I get out the camera. The kind of lighting that brings out her beautiful dark eyes apparently also brings out that orange nose. With Easter and spring rapidly approaching, I know will be taking some more photos. I won’t have much time to do a lot of detailed work editing them (not that I know how to anyway), so I was on the hunt for a quick fix. Next I decreased the opacity of the second layar down to 16%. Wallah! Just enough blue/green added so the red/blue and red/green ratios were not crazy off. It’s not perfect, but I think it’s pretty darn good quick fix. As a side note, I’ve only done this to one other photo on my blog. Brownie points if you guess which one!